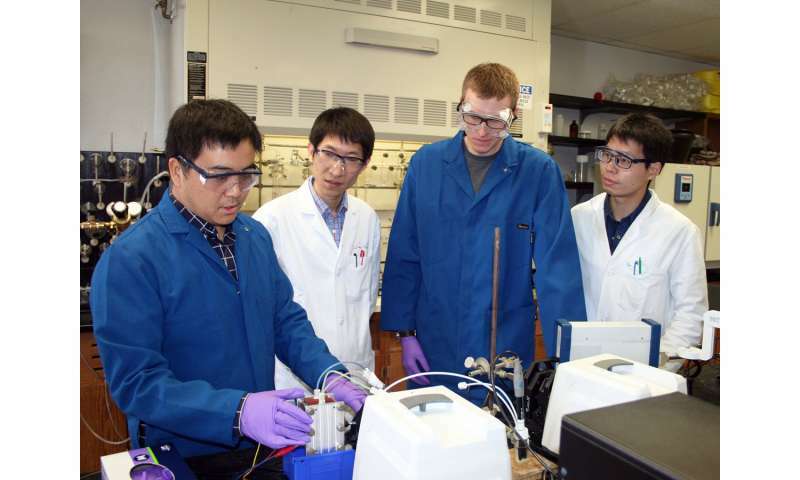 Utah State University chemists' efforts to develop alternative battery technology solutions are advancing and recent findings are highlighted in a renowned, international chemistry journal. Tianbiao Liu, assistant professor in USU's Department of Chemistry and Biochemistry, and his team reported a new molecular design for aqueous organic redox flow batteries, known as AORFBs, in the Jan. 2, 2018, issue of Angewandte Chemie, in which their paper is honored as a cover feature. In addition to Liu, the paper's authors are USU postdoctoral researcher Jian Luo and doctoral students Bo Hu and Camden DeBruler. "Organic redox flow batteries show promise for large-scale storage of renewable energy, as redox-active organic molecules are synthetically tunable, sustainable and inexpensive," Liu says. "We think they're a great alternative to existing technologies to meet growing demand for battery storage of environmentally friendly, renewable energy resources such as solar and wind power." Such renewable energy sources present challenges to use, he says, because of their intermittent availability, unstable, heavy cycling and grid energy demands. These sources require frequent changing and discharging, as well as irregular, full recharging of a robust battery. In their paper, team members describe use of synthetic chemistry to design a molecule, featuring a pi-electron conjugation unit, as a novel, two-electron storage anolyte for neutral total organic AORFBs. "The two-electron structure is a unique feature of this design," Liu says. "It enables total use of organic materials based on abundantly available elements, such as nitrogen and hydrogen. The chemists' demonstrated battery delivered a high voltage of 1.44 volts in an aqueous electrolyte, along with impressive energy efficiency and capacity retention. "The design is very robust and very stable," Liu says. Observing a long-time tradition of Angewandte Chemie, Liu dedicated the paper to his master's mentor, Professor Mei Wang of China's Dalian University of Technology, on the occasion of her 62nd birthday. "Dr. Wang is among the leaders in the field of renewable energy chemistry and was an inspiration to me," he says. The team's research is supported by USU and a Utah Science Technology Research (USTAR) Initiative University Technology Acceleration Grant (UTAG). Hu receives support from a Chinese Scholarship Council Self-Financed Students Studying Abroad Award and a Utah Energy Triangle Student Award from the State of Utah's Office of Energy. DeBruler is a USU Presidential Doctoral Research Fellowship recipient.